There are over a thousand musical examples on the Cracking the Code platform, most often accompanying our interviews and instructional material. They’re displayed on clip pages, which are structured like video pages, with a few extra features specific to music. The player section of the clip page has been turbocharged with the awesome Soundslice player, which can display simultaneous video and synchronized notation. In the next section, we’ll walk you through some of its cool features. If you don’t require notation, you can switch to the Vimeo player with the button above the video. This can help video play more smoothly on older or slower devices, so try this if you experience playback problems. Like video pages, clip pages feature handy navigation links below the player, so you can easily move to the next or previous clip in a sequence. You can also bookmark the clip for future reference. 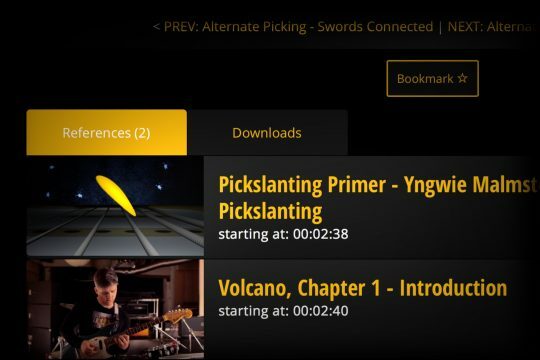 Beneath the Soundslice player, you’ll find links to download Guitar Pro and PDF files. 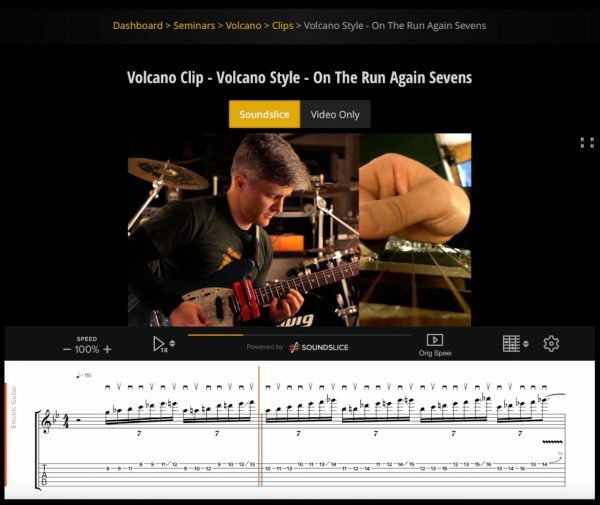 Use these to view tablature using the Guitar Pro desktop and mobile apps, or to print hard copies of the notation. The references tab is powerful. When a music clip appears in an interview, lesson, or even a blog post, we link to it here. This lets you quickly track down musical examples anywhere on the platform. If the source is a video, clicking the reference will cue it up right to the time marker where the clip appears. Awesome.